The KTM has always been one of the Best Dirt Bike Brand and this year it has launched the new 2018 KTM 250 SX-F Dirt Motorcycle for champions. This dirt bike has an impressive history of MX2 World Championship winnings. 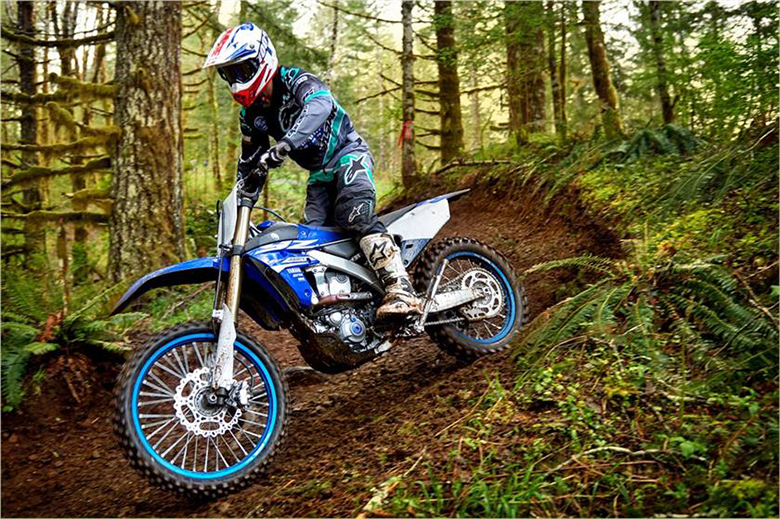 This new off road bike is an incredible combination of powerful engine packed in the lightweight and agile chassis. This combination makes it easier for the rider to control it under extreme conditions. The suspension and braking system ensure the best performance in all conditions. Following are the review and specifications of new 2018 KTM 250 SX-F Dirt Motorcycle. 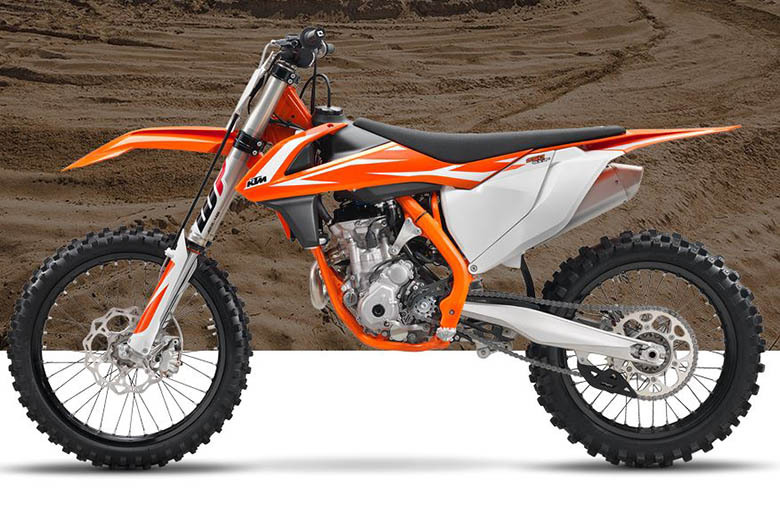 The all-new 2018 KTM 250 SX-F Dirt Motorcycle features the strong engine giving the massive amount of torque and acceleration at 14,000 RPM. It has a compact design contributing in achieving the best mass centralization. Its weight is about 26.1 kg. It has the full support of E-starter as well. 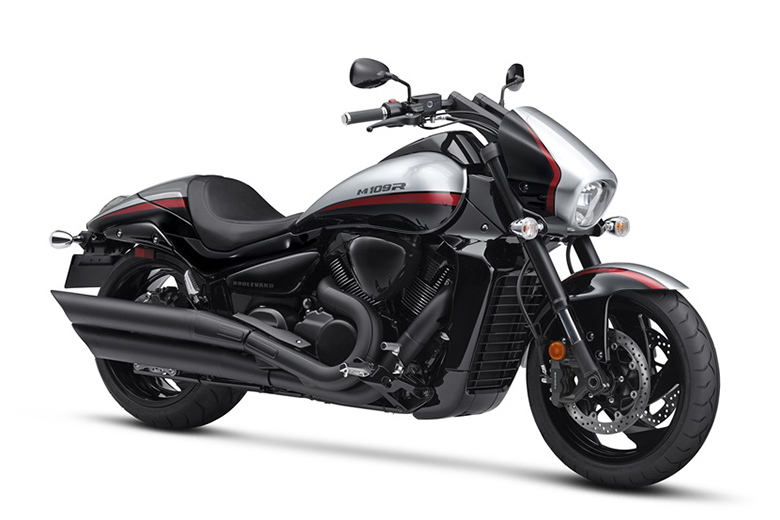 It features the compact DOHC (Double Overhead Camshaft) engine with the cutting-edge cylinder head. There are two overhead camshafts that activate the titanium valves via super-light cam containing the hard DLC coating. The crankshaft contains the short connecting rod making it compact and lightweight. The big end bearing with the two force-fitted bearing shells runs directly on the crank pin. The oil feed is used for this bearing for pressurized engine lubrication. Its new design provides the long service intervals of a crankshaft. 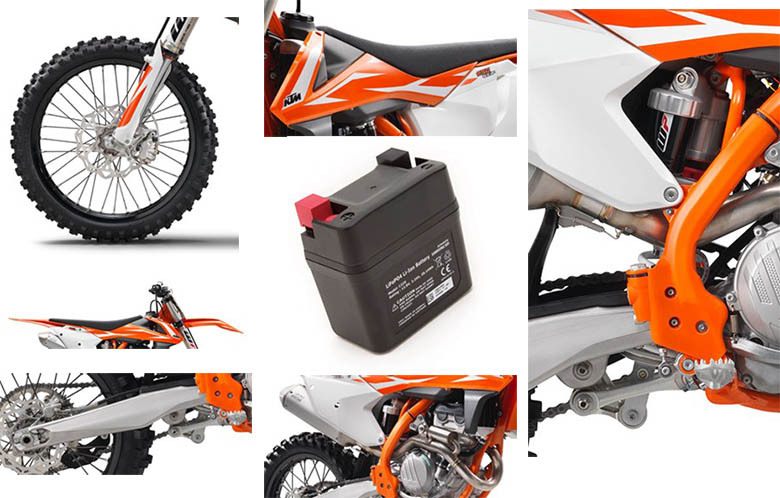 The new 2018 KTM 250 SX-F Dirt Motorcycle comes with the new E-starter as standard. The strong starter motor made by Mitsuba will fire time and time again at push of the button. Due to the use of heat resistant O-ring, it performs well under extreme conditions. 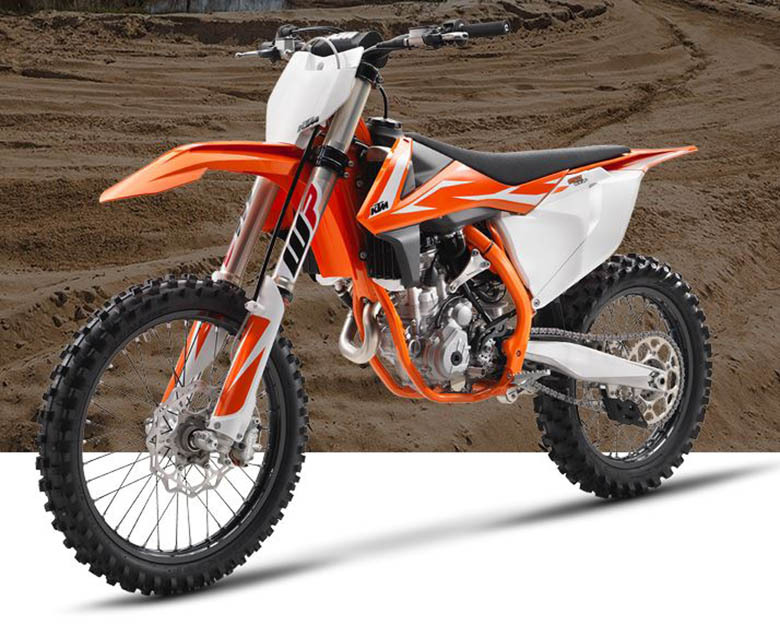 This dirt bike like the 2018 KTM 250 SX Dirt Bike, ensure the best riding experience. The new layout of die-cast crankcase provides the minimum weight and centralized shaft configuration. This design makes the engine much shorter and compact while contributing in an efficient centralization of masses. The engine covers feature the solid surface structure, which minimizes the wear caused by the rider’s boots. The strong 5-speed transmission ensures the better gear shifting experience. The latest ‘No Dirt’ gear shift lever design prevents the dirt from jamming the joint of the lever. 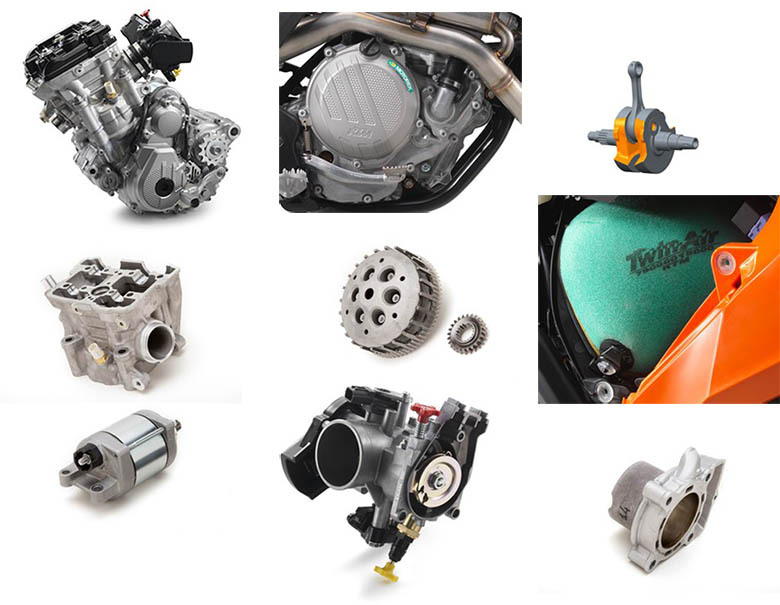 All the 4-stroke KTM SX-F engines are fitted with the gear position sensor for better engine mapping. The transmission shaft features the new C4 bearing that has the bigger overlap in the case. It simply means reliability and durability under all conditions. The state-of-the-art Keihin Engine Management System with an electronic fuel injection contains the throttle body of 44mm. The unique injector position gives an instantaneous response of the engine. The lightweight ECU contains the unique traction and launch control system for quicker response. The bore of 78mm is positioned inside the short cylinder containing the box-type piston made by CP. Its new geometry is adapted for high-compression combustion chamber 14:1. The side-mounted balancer shaft features the water pump. The engine vibration is kept minimum due to perfect balance and low oscillating masses. The new CSS clutch (Coil Spring Steel) comes with the strong steel basket and highly heat resistant clutch plates. 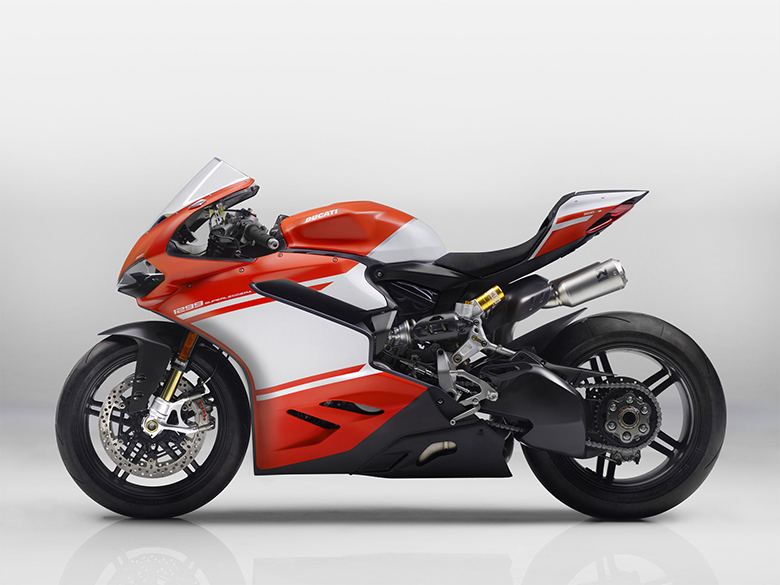 The light operation and telepathic amounts of control come as standard with the hydraulic BREMBO actuated clutch. The new cooling system routes the coolant from the cylinder head through its frame triangle directly to its new aluminum radiator made by WP. This cooling system is very efficient due to flow optimized internal circulation and CFD-calculated ventilation. The new radiator protections improve the heat dissipation. They are mounted on the front part of shrouds to protect the radiators in the crash. 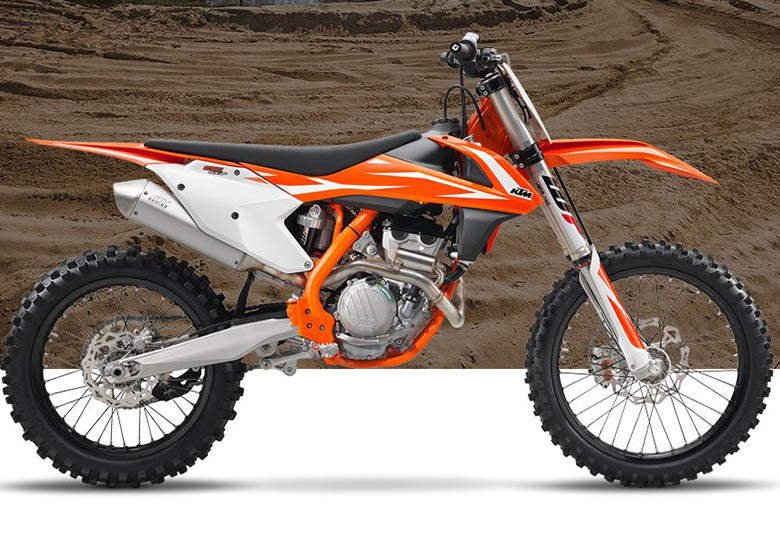 The new 2018 KTM 250 SX-F Dirt Motorcycle features the lightweight chassis with the slim frame. The KTM engineers were able to cut short in terms of weight although it comes with the electric starter as standard. 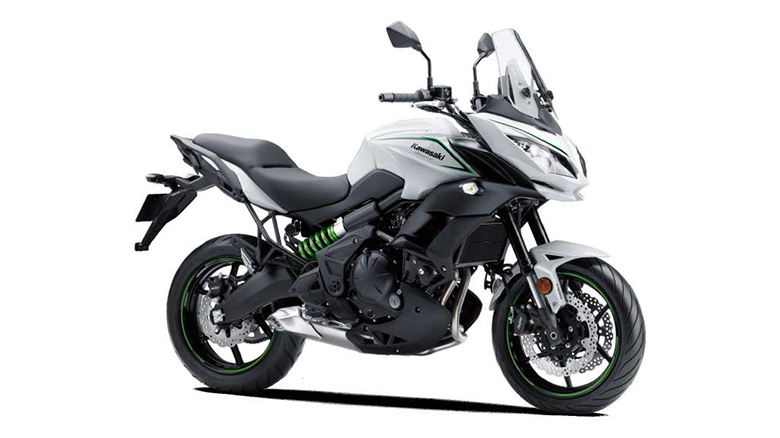 The new high-tech and lightweight chrome-moly steel frame, which offers outstanding rideability, accurate cornering, and superior stability. The high torsional rigidity and low longitudinal stiffness are among its main features. It gives better absorption of energy created from the front and rear suspension by socking up jumps and bumps. 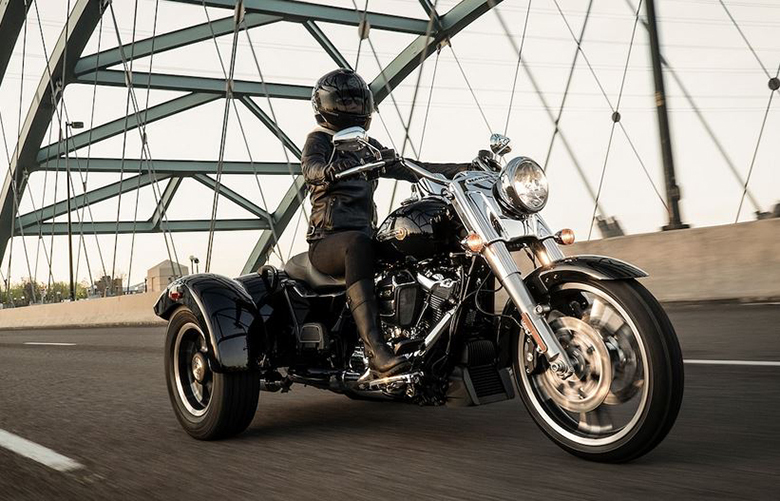 In simple words, it ensures more comfort and less rider fatigue. 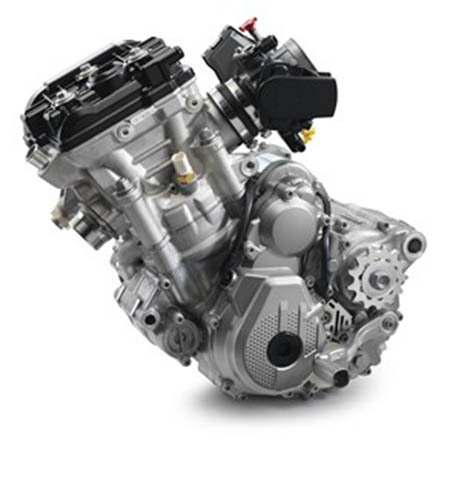 The laterally attached lightweight aluminum engine head guarantees an accurate cornering and minimum vibration level. The frame is much lighter as compared to other competitors. The light sub-frame is made up of the stable aluminum profile. The new ‘No Dirt’ prevent clogging of foot pegs pivot. If the rider wants a higher position than he can use the foot pegs of EXC models, which are about 6mm higher than SX models. The new airbox design provides the full protection of air filter against soiling. The large twin-air filter is mounted in the stiff case. The design is so simple that rider can easily pop a fresh air filter without any need of the tool. The new exhaust system to ensure the minimum level of noise output like the one used in 2017 KTM 250 SX-F Dirt Bike. 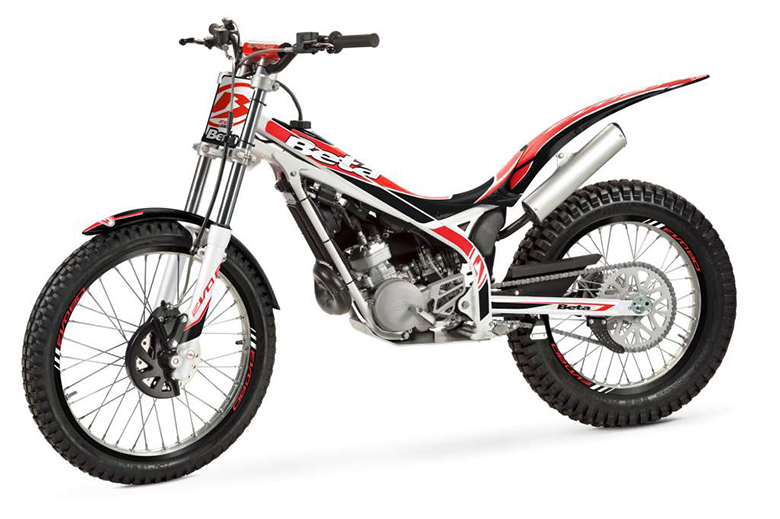 This dirt bike is fitted with the header that has unique features with an additional resonator system, which is the small chamber connected to the pipe. The short silencer is mounted closer to the engine for extra mass centralization and better rideability. Its latest internal design minimizes the noise level. The new handlebar is made by the high-strength aluminum, which is fixed in damped rubber mounts and it provides two different positions. The cast aluminum design has low weight and perfect flex behavior. The single component casting process eliminates all the weak points, which may create during welding. The lightweight polyethylene tank having the fuel capacity of 7 liters is being used. The wheels have lightweight CNC machined hubs and high-end Excel rims ensure the maximum stability. These wheels contain the latest Dunlop Geomax MX 3S tires. The new WP shock absorber has been developed according to the frame and swingarm design. It includes the linkage and WP AER 48 front fork. It contains the black anodized components with the rough cast reservoirs. The lightweight WP AER 48 front fork comes with the 48mm of USD air-sprung fork developed by WP in close association with KTM. It is a split fork containing the separate function for each leg. The damping function of this KTM bike is on its right side while the air spring is kept on left. This left leg contains the 2 chamber system with the capsule air cartridge to the minimum the loss of air pressure. The air spring is very easy to adjust according to the weight of a rider. The right fork leg integrates to the damping cartridge. It is fully adjustable according to the track condition. 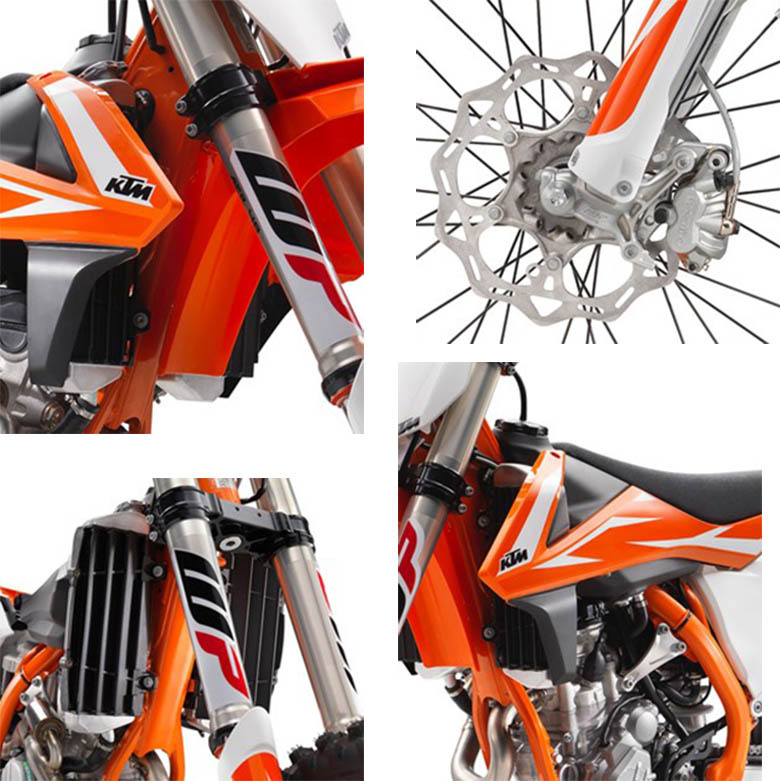 The new triple clamps are high quality with CNC machined containing the KTM trademark to ensure precise handling. The high-quality Brembo brakes come with the lightweight wave brake discs. They ensure the stronger and faster braking experience. The new 2018 KTM 250 SX-F Dirt Motorcycle is equipped with the multi-functional handlebar map select switch. This switch is useful for activation of traction control, activation of launch control and selection of an alternative power curve. 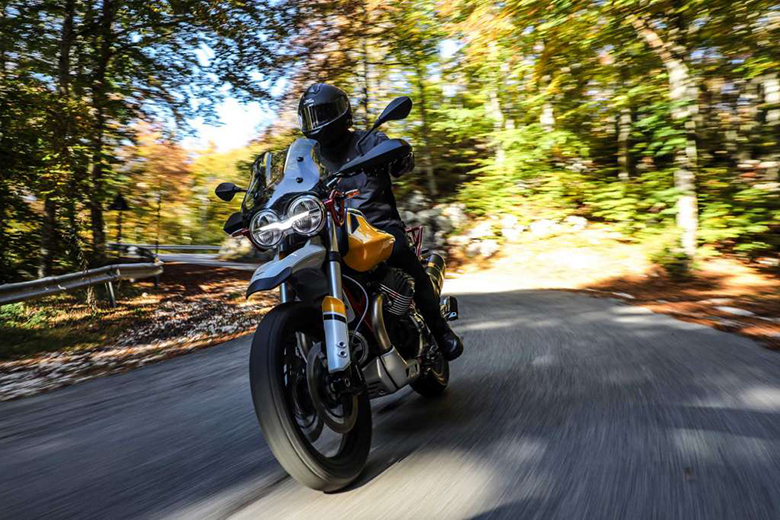 The traction control ensures better traction for best riding experience. The rider can also activate the launch control for more efficient starts. The map select switch provides the rider a chance to select an alternative and powerful map for best and standard configuration. The strong and lightweight lithium ion battery is being used in it. This battery and wiring harness are centralized in the compartment located above an air filter box. The new E-starter comes as the standard allowing rider to start the motorcycle with just pushing the button. The new R&D KISKA Design has created a complete harmony between the rider and bike by shaping the plastic. It has the perfect ergonomics with ultimate contact points for maximum comfort. 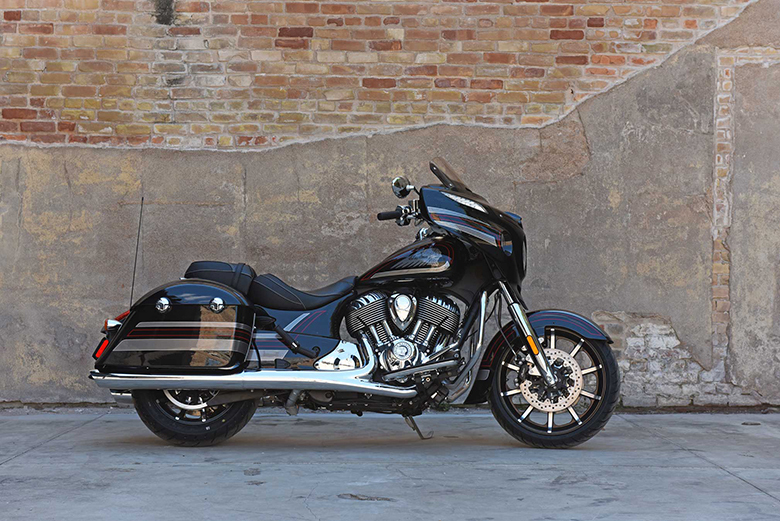 The I-beam structure of the front and rear fender ensure the best stability and low weight. The graphics are dominated by Factory Orange color.